You may want to grab some tissues, because you’re probably going to need them. There’s a paparazzo in London who’s so devoted to his favorite subject that it’s as touching as it is downright tragic: The sad soul can be found seven days a week, 365 days a year—rain or shine—haunting the alleyway outside Amy Winehouse’s old dry cleaner in London with his camera at the ready, despite the fact she’s been dead for six years. It just doesn’t get more heartbreaking than that. The loyal pap’s name is Dominic Hedward, and his dedication to ruthlessly invading Ms. Winehouse’s privacy is so strong that he diligently hides behind the dry cleaner’s dumpster with his zoom lens affixed to his camera every single day, even though she’s never coming back. His fond memories of snapping pictures of Amy outside the dry cleaner with an exposed bra strap or maybe even without makeup are so strong that he just can’t bring himself to leave his post. Dominic’s unflinching devotion is such a moving sight to behold that local businesses have even started to look after him, with restaurants in the area feeding him scraps of leftover food at the end of the day. It’s rare to find someone so completely committed to exploiting someone for profit that they refuse to give up even after the person they stalk has passed, and that’s what makes Dominic so special. In a true test of his loyalty to his favorite subject, Dominic recently received a text that Emma Stone was shitfaced in a nearby pub. 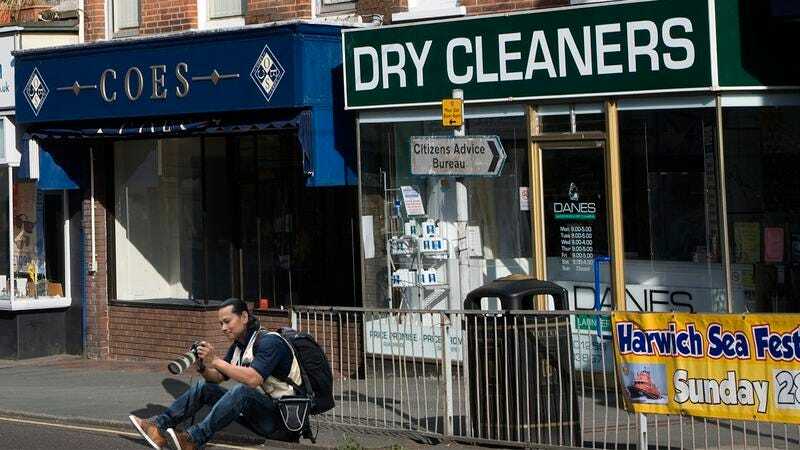 It could have resulted in some great shots that likely would’ve made him a lot of money, but he stayed put with his lens focused on Amy Winehouse’s dry cleaner’s front door, waiting for her to step out in some sort of unflattering outfit, even though she never will. Beautiful. As heartrending as his story is, Dominic is a powerful reminder to cherish the things that matter most to you in life before they’re gone.